The Gophers need to beat Wisconsin, which they haven't done in more than a decade, to become bowl eligible. We'll be here with social media and more from Star Tribune staff from before kickoff until the final play. We want to see your celebration pictures and videos #Gophers ! Tweet us and let us know how pumped you are to see the axe come home. This party is just getting started #Gophers ! Gophers rushed for 200 yards. Produced four turnovers and scored TD on special teams. Can't remember a more thorough Big Ten win for them. This is a big moment for Fleck's program. Final: #Gophers 37, Wisconsin 15. The Axe is coming to Dinkytown. Ha. Gophers didn't even wait until clock expired. Took off running for end zone with 26 seconds left. Wisconsin gets TD and two-point conversion with 1:12 left, cutting #Gophers lead to 37-15. #Gophers Bryce Williams adds a 16-yard TD run with 2:31 left. Gophers lead 37-7 with 2:31 left. #Gophers get 4 yards for the first down. Clock ticking. I was covering the last win and saw that mad dash to grab the Axe. Guessing this one, after 14 years, is going to be just as spirited. Wisconsin takes final timeout with 3:46 left. #Gophers face fourth-and-4 at the Badgers 23. Update: our caps locks button broke. A loud Let's Go Gophers cheer from fans after that INT. Another Wisconsin turnover. Chris Williamson intercepts Hornibrook. #Gophers have ball at Wisconsin 29 with 4:43 to play. Carpenter nails the PAT and the #Gophers lead 30-7 with 4:56 left in the game. The last time Gophers held Badgers to this low of point total was 1990 when Badgers scored only 3 points. I have to think Joe Rossi will have interim tag removed after season. #Gophers Carter Coughlin sacks Hornibrook, and Thomas Barber recovers fumble. On first play after turnover, Bryce Willams runs 23 yards for a TD. Gophers lead 30-7 with 4:56 to play. 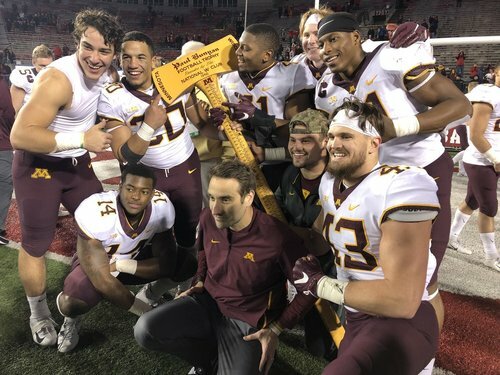 Gophers getting closer to grabbing that Axe. TD by Williams and it's 30-7. Totally dominant performance in all three phases. Fleck had his team prepared. Lots of credit deserved for this one. Sack-strip fumble and Gophers recover. This is some big-boy football by Gophers today. Carpenter's 28-yard FG attempt is no good. #Gophers defense will take the field as Badgers have 1st and 10 at the Minnesota 20. #Gophers Emmit Carpenter misses 28-yard field-goal attempt wide right. Wisconsin takes over at its 20 with 5:37 to play, trailing 23-7.